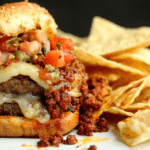 Latin Burger: Beautiful Mexican flavors find their way to your summer grill in this delicious recipe pairing Omaha Steaks hamburgers with chorizo, monterey jack cheese and pico de gallo. Deliciously juicy burgers piping hot from the grill are what summers are all about. I have come to expect and look forward to my share of burgers throughout this season. However things have gotten a bit stale around my parts in that department. 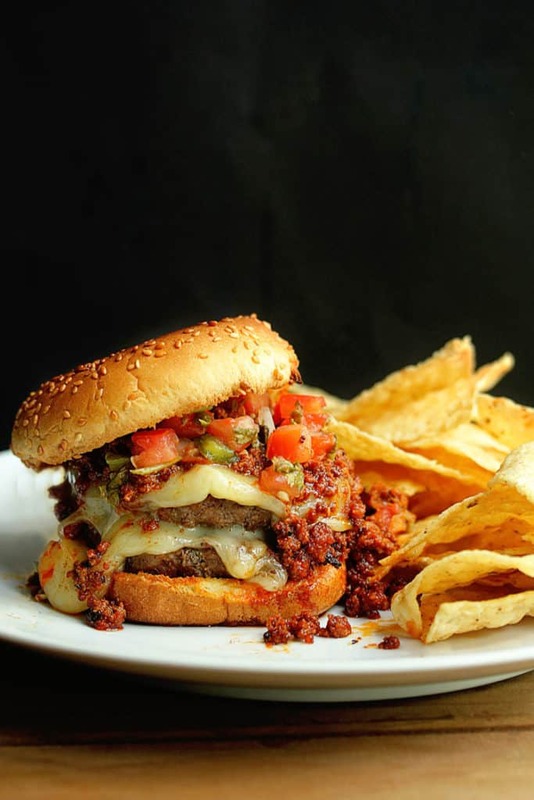 This latin burger idea came from a serious need to spice things up in my kitchen (literally). The flavors of this burger are insane! Thanks to the quality burgers of Omaha Steaks, you can never go wrong with their products. Adding unique flavors to their already sound products was just icing on the cake! So what did I do to this Latin burger to make the flavors come alive? Well first I knew that adding some chorizo would be fantastic and unexpected. Spicy sausage and beef together are now a match made in heaven. They complement each other well. I think it was a good call. I used two patties and added a milder yet flavorful monterey jack cheese and then topped everything off with pico de gallo. This is rich in tomato, onion and cilantro flavors that scream Mexico in the most sensational way! I fell all the way in love with this burger. Let’s just say the rut is officially gone. Ready to try this out for yourself? 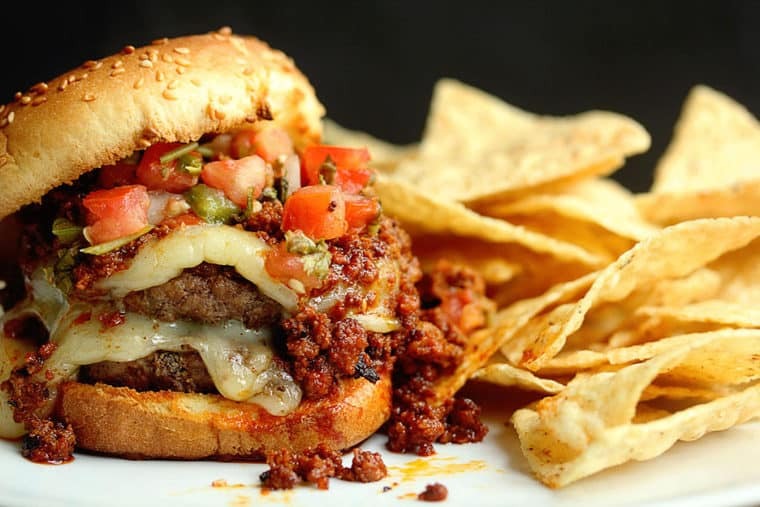 Beautiful Mexican flavors find their way to your summer grill in this delicious Latin Burger pairing Omaha Steaks hamburgers with chorizo, monterey jack cheese and pico de gallo. While grill heats, add olive oil to medium sized pan over medium high heat. Once hot, add chorizo sausage and cook until well done throughout. Set aside. Season both sides of all burgers with adobo seasoning and pepper to taste. Grill all burgers on both sides until reaching desired doneness. Add slices of cheese on each individual burger patty, allow to melt then remove patties from grill, place on baking sheet and cover with foil to keep warm. Top with pico de gallo and serve with tortilla chips. Disclosure: I was compensated by Omaha Steaks for this post but all opinions expressed here are my own. Wow, that is what I call a burger!! Thank you so much Emanuele!! Oh my – is it too early to have this for breakfast? Because I need one right now. My belly could use a latin lover like this burger. Oh my gosh!! I am drooling.. its breakfast time here and I am so craving it right now.. yummylicious!! Wow, that’s is a beautiful looking burger! I love all things pico de gallo, I can’t imagine how yummy it’ll be on a burger! Same here. Pico De Gallo is my bae! Oh my gosh Jocelyn!! You are mean to this pregnant lady. 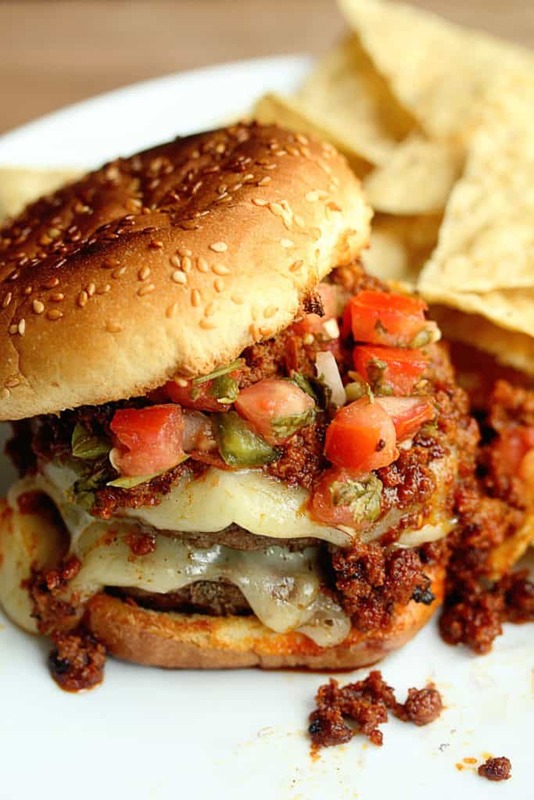 All I want is THIS burger…right now!! What an amazing looking burger!! I SO want a bite of this right now!! Wow. I’ve seen burgers, but this is a BURGER. If you sold this thing, it would make some serious bank. Oh my gosh, Jocelyn! This burger and those flavors… awesome!! Thus burger looks incredible. Chorizo and beef together in one – always a good idea. Wow! That’s how you make a homemade burger! Double or nothing-Take it to the face! this burget – it’s on my kind of overload! i want to sink my teeth in it! Oh my god. OK, I’m booking a flight to Chicago just to come sit at your kitchen table and eat this burger. Acceptable? Mercy! Jocelyn I’m actually craving this burger for breakfast as I sit here! I know my family would love this too! Ah-mazing! Your family would adore this! Holy moly. I’m seriously drooling over here. This is one awesome burger! And I just love Omaha steaks products – they are seriously the best! They are totally the best, and this burger was a nice use of their products for sure! Nice!!!!! That cheese dip sounds insane! This is the burger of all burgers! Pinning! It definitely wears the crown well. It’s 6 am and I am CRAVING this burger! It looks like one of those drip down your face, get on your clothes, PERFECT burgers! Perfect for weekend eats. Pinned! Yep it is totally that burger!